Intel has been moved to shift into top gear since AMD launched a flurry of Ryzen processors during the preceding months. One key component of attempting to keep AMD at bay has been a refresh of the Intel high-end desktop platform (HEDT). Broadwell-based chips and the X99 platform make swift way for a two-pronged strategy encompassing four hugely multi-core Core processors hewn from Skylake technology and, in an arguably strange move, semi-castrated Core i7 chips from the newer Kaby Lake architecture. Swings and roundabouts. What we do know is that the presently-available 10-core, 20-thread Core i9-7900X is the best consumer chip going, ousting the AMD Ryzen 7 1800X and previous champ, Intel Core i7-6950X, from top spot in any multi-core benchmark that matters. Yet Intel is acutely aware that the $999 price tag, which is considerably lower than the $1,699 charged for 6950X, still puts it out of the reach of many. Addressing this problem, and by association the price-to-performance metric championed by AMD Ryzen 7, are six- and eight-core Core i7 models with more amenable fees. A case very much in point is the Core i7-7820X - an eight-core, 16-thread beastie offering an all-core 4.0GHz speed for just $599 (£550). 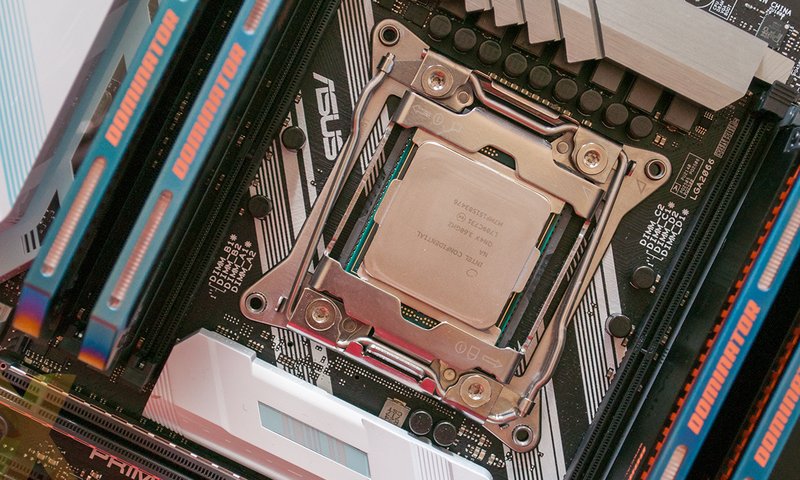 Putting it another way, this sixth-rung Skylake-X processor ought to perform at similar speeds to the one costing almost three times as much just last year. It is no stretch to say that such 'reasonable' pricing is directly attributable to Ryzen 7's arrival. A brief recap shows just where the Core i7-7820X fits into the present and future Intel HEDT hierarchy. It may only feature mid-way in the Intel stack, but make no mistake, this is a performance processor first and foremost. For those not yet in the know, all of the processors in the above table require a discrete graphics card in the system; there is no baked-in IGP. The way in which Intel segregates the HEDT family doesn't help this chip. Lots of innate CPU horsepower is left wanting when considered from a platform and ecosystem point of view. We say this because Intel chooses to limit the number of PCIe lanes emanating from the chip to 28, down from 44 on the 7900X. No problem if you use just a single graphics card and have a drive or two, yet we are of the opinion that no performance CPU should be compromised by inadequate PCIe provision. Adding a second graphics card and a couple of fast NVMe storage drives easily saturates the I/O on offer, thereby putting the onus on motherboard manufacturers to use expansion switches and to inevitably increase end-user cost. AMD, on the other hand, keeps far better consistency with its Ryzen 7 range, as each chip, irrespective of how much it costs, is equipped with more generous I/O. The good part is that Intel uses the same quad-channel memory support present on previous HEDT chips but is now rated at a higher DDR4-2,666 speed. Of course, opting for any of these new chips means investment in an Intel X299-based motherboard, costing north of £200, though the one silver lining is that you can re-use any extant cooling as the boards have the same mounting-hole locations as X99. 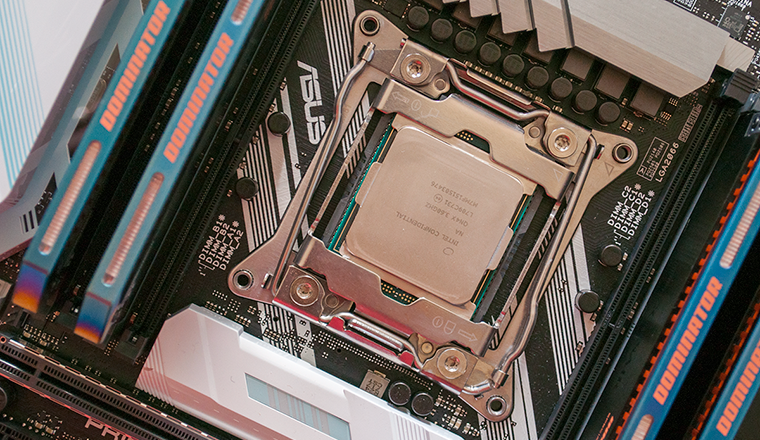 Core i7-7820X is an easy sell to those who have historically trodden the Intel path. It is vastly cheaper than last year's champ, to the tune of $1,100, yet, combining frequencies and core speed, could be faster in real-world tests. Comparing against older Intel processors is verging on being moot. What is of considerably more interest is how the Core i7-7820X is able to handle the premier Ryzen 7 1800X - a chip that hits the financial scales at $499. Let's load up the test system and find out.